TATOOINE - Following the grisly discovery of the remains of a Republic Clone Trooper on the outskirts of Sector 764, a remote outpost on the desert planet of Tatooine, Supreme Chancellor Palpatine has mobilized an elite Jedi unit to apprehend the likely suspects, a pair of interplanetary bandits known collectively as the "Crazy Dogs." Clone Trooper Battalion 55 found the body of their fallen comrade after a search and rescue mission, immediately following reports that one of their own had been abducted from a plateau region commonly referred to as Patio Table. Troops mourn the loss of their comrade. "He put the action in action figure," they fondly recall. "I had a few scouts hold their position on Patio Table after a day of military exercises in The Sandbox zone," explains Commander BD. "Their armor was infused with excess sand, and judgment told me that Interior Minister d Wife would not want them to enter the Home Zone in that state of contamination." Sometime during the evening, as the troopers slept, one scout was abducted from the unit. Hopes for a safe return were dashed when searchers found what was left of him the next morning. "This is an outrage," stated Chancellor Palpatine at a press conference that afternoon. "We will spare no resources to ensure that whoever did this is captured and punished to the full extent of the law. Our elite military investigative unit staked out the area and have solid surveillance footage of the suspected perpetrators returning to the crime scene." Surveillance footage spells doom for the "Crazy Dogs." An elite Jedi unit led by Obi Wan Kenobi protoge "Kid Fury" has been dispatched to Tatoonine to launch a large-scale manhunt. Newly appointed Jedi Knight Kid Fury readies his team for his first mission as a unit leader. 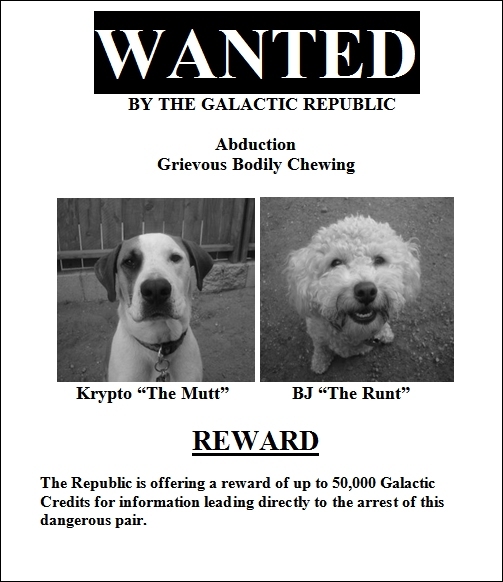 To expedite efforts, the Chancellor hopes to entice bounty hunters across the galaxy to join the hunt by issuing a 50,000 Galactic Credit reward for information leading up to the capture of the "Crazy Dogs." "Use extreme caution," Palpatine warns. "And biscuits."